0.5 Meter mini USB Cable, type A to mini B 5 pin. Connects devices such as: digital camera and mini DV camcorders to a PC via USB port. The USB 2.0 to VGA Adaptor allows the user to mirror or extend their current PC or laptop desktop across another monitor up to resolutions of 1680 x 1050 on a VGA/SVGA monitor. 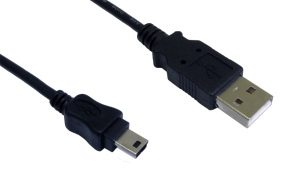 2 Meter Mini USB Cable, type A to Mini B 5 pin. USB 2.0 A male to mini B pin. Connects devices such as: digital camera and mini DV camcorders to a PC via USB port. USB 2.0 specification. USB A male to Mini B pin. 2 meters in length. Colour black.